It’s hard to believe it has been almost 20 years since Tracy Chapman drove into the limelight and sped up the charts with her breakthrough single, “Fast Car.” Though she’s nailed several other singles to lesser degrees of notoriety, that track has obviously become her staple and calling card throughout a consistent stream of touring and releasing records. In the early days, she appeared right alongside the legendary likes of Peter Gabriel, Youssou N’Dour, and Sting (when he was still cool), moving into headlining status due to an extremely dedicated fan base. In fact it was that rabid following — perhaps more than the actual public awareness of her latest CD, Where You Live — that packed the Riviera Theatre for a relatively intimate engagement. Gathering from a bit deeper in the past, the performer picked the cozy coffeehouse cut “Telling Stories,” known for the hauntingly candid line “sometimes a lie is the best thing” when referring to a complicated relationship. “Fast Car” was presented startlingly early in the program catching many faithful off guard, but immediately becoming the most obvious sing-along. The romantic “Baby Can I Hold You,” along with the gospel tipped “Say Hallelujah” (from 2002’s overlooked Let It Rain) best demonstrated Chapman’s respectable vocal range and powerful pipes. But the audience got its chance to participate yet again, first with the call to action “Talkin’ Bout A Revolution” and then the sultry “Give Me One Reason” (which was instantly reprised as a blues barnburner). A cover of Nirvana’s “Come As You Are” seemed unnecessary and unnatural, and could’ve easily been excluded for any overlooked original album gem. Despite all of Chapman’s moving and often proactive messages, there was still a set of hurdles she couldn’t quite clear in concert. Like many musicians who pour their entire souls into the writing, they lack the stage presence and entertaining abilities grasped by better-rounded artists. This particular performer had incredibly awkward song transitions, spoke stiffly, and seemed mostly distant until easing up a bit come the encore. One would’ve hoped she would’ve been a bit warmer, especially in the club atmosphere of the Riviera (as opposed to the potentially intimidating Chicago Theatre where she played last time through) though that unfortunately wasn’t the case. However, it’s not enough to discount Chapman’s obvious abilities or important place as a troubadour and those qualities should ideally give her an elevated general public perception than the handful of hits heard on radio. She’s been on the scene almost 20 years, and Tracy Chapman’s still talkin’ bout a revolution. A tame sit-down-only crowd at the Riviera Theatre in Chicago got a taste of four-time Grammy winner Chapman’s just-released “Where I Live,” mixed up with her best old stuff. Recorded in a one-room studio, “Where I Live” maintains an intimate sound that complements the acoustic guitar and simple lyrics that Chapman is known for. Saturday night’s show, like all of Chapman’s work, varied radically between the personal and the political. You get the impression she’s one of those still touting that the personal IS the political. One new song, “America,” challenges the “conquering” of the New World from its accidental, or providential beginning, depending on whose interpretation you choose. It’s a brazen affront to the “White Man’s Burden” and the settling of our United States by Some on the backs, and at the expense of Others. She sang it like it is, under screaming red lights. Harsh words at a time when political dissent is being equated with a lack of patriotism. You got the feeling that is no accident. The Ohio native — who played in an African drum ensemble in college — pounded out the beat herself for “America,” standing in silhouette between the drums, guitar over her shoulder, wild and beautiful dreads, singing in that alto voice. It was a powerful image, worthy of the song’s message. The folk artist who is part of so many humanitarian causes plugged for local Habitat for Humanity projects, mid-show, without apology. At any other concert, the message might have been swallowed up in the noise, but not here. People came to listen not only to hear music but to hear Chapman’s message. Her mellow music could almost make you lullaby sleepy if not for the sneaky energy that grabs you and keeps you attentive. And Tracy’s audiences don’t need loud to hear. One of the high moments of the concert was about funerals — sort of. Chapman warned the audience it a “strange song” for those who hear it the first, or even the second, time. No need to explain. She showed us what she meant. And “Be Someone” could have carried the whole show, if she hadn’t outdone it with a wild take-out during “Give Me One Reason” at the end. It was a shame, at that point, that this was a sit-down show. Chapman’s rendition of the story revealed the artist’s sense of humor and made you wish you she’d show more of this side of Tracy Chapman. But her fans will take what they can get, and smile while they think over her words. The house wasn’t even packed. Did Chicago forget this woman has four Grammys? Or is her message too thoughtful to draw bigger crowds? I’m not sure, but I don’t think Tracy Chapman cares. That’s why it was a great show. 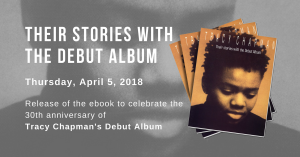 In 1988, neo-folkie Tracy Chapman released her self-titled debut, an arresting collection of songs that included the memorable “Fast Car.” While Chapman has recorded steadily for the past 17 years and cultivated an adoring following, her only approximation of that debut’s success was “Give Me One Reason,” from 1995’s “New Beginning” album. In concert Saturday night at the Riviera, a subdued Chapman performed both songs but also offered intimate glimpses into her full catalog, with a few choice covers along the way. First, though, fans had to endure an hourlong wait before Chapman and her band took the stage. If her low-key entrance was any indication, Chapman did not appear even to sense any of that anticipation. Instead, she waded through the tremulous opening notes to “Why?,” a searing moralistic tune that resonates today with its socially minded lyrics. “Somebody’s gonna have to answer / The time is coming soon,” she sang, and her honey-tinged contralto — her musical signature — crackled with muted anger. For much of the first half of her 90-minute performance, Chapman was similarly measured. Backed by two able players, guitarist Joe Gore and drummer Quinn, Chapman’s approach was decidedly bare-bones. Many of her later albums also have mined sparse soundscapes and, at their best, have achieved a haunting intimacy. At its worst, Chapman’s recent recorded output is unfortunately plodding and directionless. In concert, that same tension became apparent. Not exactly an ebullient performer, Chapman’s minimalist choices can, for casual listeners, become unnecessarily anesthetizing. Worse, she sometimes managed to siphon her own tunes of their sparkling emotion. Songs like “Talk to You,” from “Where You Live,” her strong new album (it’s her most focused release in years) and the usually tender “Baby Can I Hold You” lost their languorous brilliance. Instead, the latter felt chilly and aloof. Even Chapman’s rich singing neglected the song’s emotional underpinning. Thankfully, Chapman injected some needed adrenaline into the show during “America” when she strapped on an electric guitar and nimbly plucked its darting riff. Not as subtle, though, Chapman struck hand drums to punctuate her pointed verse. “Your hands are at my throat / My back’s against the wall,” she sang, as the melody dissolved into a delicious and messy tangle of percussion and electric guitar, in the closest to a punk song she’s ever written. Equally arresting, “Say Hallelujah” spiraled into an all-out bluesy stomp as Chapman celebrated the life of a deceased friend. After almost an hour of dejection, thank goodness Chapman hit the defrost button. It’s not that her set succeeded just at its more rocking points — she is a folkie at heart — but those kinetic moments illustrated how powerful Chapman’s smoky croon can be when she just lets go. Yes, her protest songs are still her strongest, and “Talkin’ ‘Bout a Revolution,” for instance, lost none of its urgency despite its rootsy musical setting. But perhaps Chapman does have secret designs of becoming a rocker. She opened her encore with a cover of Nirvana’s “Come as You Are,” which managed to sound just like a, well, Tracy Chapman song. But consider that a high compliment. With its spectral sound and hollowed guitars, Chapman boiled the rollicking tune to its essence but sacrificed none of its grit. Now, if she could just do that with her own material consistently in concert, her live performances would markedly improve. Emily LaFramboise, 10/17/05: I traveled from Detroit to Chicago to see Tracy’s performance at the Riviera Theatre. The following is the setlist (above): It seemed like a short set. It was a little disappointing because the sound quality was not good and it was difficult to hear Tracy’s voice at times. The venue felt more like a bar atmosphere, with people socializing and getting up for drinks often throughout the show. Nonetheless, her performance was amazing. My personal favorites were Be and Be Not Afraid and Knockin’ On Heaven’s Door…both were beautiful. Talkin’ Bout a Revolution, Fast Car, Another Sun and Why? were all performed a little different that usual which was a nice treat. I’m keeping my fingers crossed that Tracy comes through Detroit after her European show…the experience of seeing her live is something that’s difficult to even put into words. Thanks Tracy!